Saturday April 27, 2019 1:00 PM Join us as we welcome in author Brian Wright. He will be in signing his book Success Profiles: Conversations with High Achievers. It is a unique collection of wisdom from some of the greatest leaders in personal development and success today. For those interested in financial excellence, self development, building businesses, and leadership. Don't miss out on this opportunity! Monday April 29, 2019 3:30 PM "Tail Waggin' Tutors is a reading program designed for young readers to improve their skills by reading to Daisy, a certified Therapy Dog. This creates a pleasant experience with both reading and dogs simultaneously. It provides a fun, relaxed, safe, and non-judgmental atmosphere for children to read to a furry friend!" Friday May 03, 2019 10:00 AM Local author, Sylvia Nobel, will be in the Goodyear Barnes & Noble to sign copies of her award-winning Kendell O' Dell mystery series. The first book in her series, Deadly Sanctuary is available in DVD. 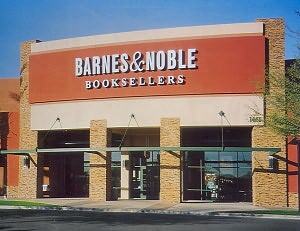 Saturday May 04, 2019 10:00 AM Local author, Sylvia Nobel, will be in the Goodyear Barnes & Noble to sign copies of her award-winning Kendell O' Dell mystery series. The first book in her series, Deadly Sanctuary is available in DVD. Monday May 06, 2019 3:30 PM "Tail Waggin' Tutors is a reading program designed for young readers to improve their skills by reading to Daisy, a certified Therapy Dog. This creates a pleasant experience with both reading and dogs simultaneously. It provides a fun, relaxed, safe, and non-judgmental atmosphere for children to read to a furry friend!"